Frogs are an important part of a freshwater biome. During its life a frog undergoes a series of transformations, from an egg to a free-swimming tadpole and from a tadpole to a land-dwelling frog. At each stage of its life a frog is vulnerable to a variety of predators that can take a toll on the frog population. With leopard frogs, up to 95 percent die as tadpoles or new froglets, according to Animal Diversity Web. Frogs and tadpoles alike fall prey to a wide variety of birds and reptiles. Many kinds of birds who live in and around freshwater biomes can eat smaller frogs and tadpoles. 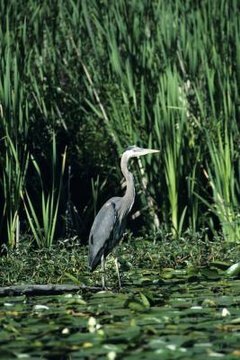 Large bullfrogs are safe from all but the bigger birds, such as herons. Common avian predators of frogs include ducks, geese, swans, wading birds, gulls, crows, ravens and hawks. Frogs are also at risk of becoming a meal for garter snakes, water moccasins and other swimming snakes. Although many mammals avoid certain kinds of frogs and toads because of their foul skin secretions, not all frogs have a bad taste that repels predators. Almost all mammals in a freshwater biome will prey on frogs if they can catch them. This includes raccoons, mink, foxes, otters, opossums and humans. Although these animals don’t necessarily live in the freshwater biome, they come to it seeking food and might pluck frogs from the water or from along the shore. Because frogs must keep their skin wet to breathe, many of them spend much of their time in water, or on plants in or near water. Although this helps keep them safe from some land-based predators, it makes them more vulnerable to those that swim. Fish are a danger to frogs, as are many kinds of aquatic turtles. Frogs also must beware of other frogs, since some carnivorous frogs won’t hesitate to eat anything they can swallow. Frog eggs, tadpoles and very small, immature froglets face danger from many creatures too small to eat most adult frogs. Predators such as leeches, dragonflies, dragonfly larvae, newts, diving beetles and other large water bugs eat frog eggs. Most of them eat tadpoles as well, especially the smaller tadpoles. The younger forms of frogs also face predation from many of the larger animals that prey on adult frogs, though for some of these predators, tadpoles or frog eggs aren’t worth hunting down. What Eats Frogs in the Rainforest?